Opera Maine is proud to present a new production of Mozart's masterpiece The Marriage of Figaro, a comic satire often described as "the perfect opera." Mozart's sublime music in The Marriage of Figaro has delighted audiences since 1786, and the captivating plot, with its dynamic characters and themes of social and sexual tension, is sure to excite today's audiences. 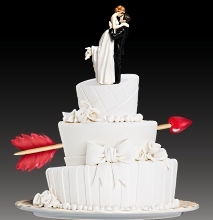 The Marriage of Figaro will be performed at Merrill Auditorium on Wednesday, July 25 and Friday, July 27 at 7:30 p.m. Conducted by Stephen Lord, who was chosen by Opera News as one of the "25 Most Powerful Names in U.S. Opera," The Marriage of Figaro includes a cast of renowned veterans of the world's greatest opera houses. Keith Phares will perform the role of Count Almaviva and soprano Danielle Pastin is the Countess. Returning to perform with Opera Maine are tenor Robert Brubaker as Basilio, baritone Robert Mellon as Figaro, and soprano Maeve Höglundas Susanna. Mezzo-soprano Hongni Wu joins the cast having just won the Metropolitan Council Auditions. Also featured in this star-studded cast are soprano MaryAnn McCormick as Marcellina, and bass Kevin Glavinas Bartolo. Opera Maine's Artistic Director, Dona D. Vaughn, and the production team that includes Portland native and Tony Award-winning lighting designer Chris Akerlind have taken a new consideration of time and place in this fresh approach to the opera's amusing imbroglio and Figaro's impending marriage. Audiences will escape to a night of intoxicating comedy and unforgettable melodies, including the duet popularized in the movie The Shawshank Redemption. The opera will be sung in Italian, with projected translations in English. Wednesday, July 25 at 7:30 p.m. This summer, the Young People's Chorus of New York City (YPC), led by Founder and Artistic Director Francisco J. Núñez, continues its 30th anniversary celebration with performances in seventeen cities spanning three countries. YPC's summer launched on Sunday, June 24, when the chorus was joined at Carnegie Hall by young singers from around the world. Additional summer performances include a free concert at Marcus Garvey Park in Harlem, YPC's return to the Mostly Mozart Festival at Lincoln Center, and tours to Canada and Japan. Shortly after returning from the five-day International Choral Kathaumixw festival in British Columbia (see below), the Young People's Chorus of New York City under the direction of YPC Associate Artistic Director Elizabeth Núñez reprises the Canadian tour program in a free pre-curtain concert at The Classical Theatre of Harlem's performance of Sophocles's Antigone at Marcus Garvey Park. Both the pre-curtain concert and performance of Antigone are free and open to the public. For more information, visit ypc.org/event/cth-precurtain-antigone. Tuesday, July 17 and Wednesday, July 18 at 7:30 p.m.
Young People's Chorus of New York City returns to Lincoln Center's Mostly Mozart Festival after debuting last summer in the festival's opening concert. This July, under the direction of Elizabeth Núñez, YPC joins the Mostly Mozart Festival Orchestra and Music Director Louis Langrée in Bernstein's Mass: A Theater Piece for Singers, Players and Dancers. In celebration of the Leonard Bernstein centennial, these performances feature a new, fully-staged production by director Elkhanah Pulitzer in her New York debut, and also feature baritone Nmon Ford (as the Celebrant), the Concert Chorale of New York, a marching band, and dancers. For more information, visit lincolncenter.org/mostly-mozart-festival/show/bernstein-mass. Choristers of the Young People's Chorus of New York City on tour, 2018. Additionally, on Wednesday, July 4, YPC performs in concert with three other participating choirs--Crescent Collegiate Vocal Ensemble (Canada), Ad Una Corda (Slovak Republic), and Pan African Choir (Uganda)--at the Max Cameron Theatre. Miami Music Festival brings you a full week of opera, featuring Britten's A Midsummer Night's Dream and Strauss's Ariadne auf Naxos at the Broad Auditorium, plus an intimate studio opera featuring Handel's Teseo. The Los Angeles Master Chorale today announced that it will receive a $1 million gift from philanthropists Kiki and David Gindler. The pledge was announced at the annual meeting of the Master Chorale's Board of Directors held today at The Music Center where the choir is a founding resident company. 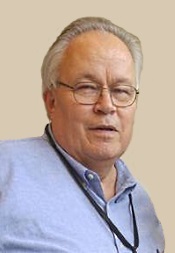 The meeting was Mr. Gindler's last in his role as Chair of the Board, a position he has held for two three-year terms, the maximum term allowed. This is the second $1 million gift the Gindlers have made to the Master Chorale. The first gift, announced in 2012, established the Artistic Director's Circle, a group of dedicated supporters who donate $50,000 or more to the organization to support core institutional programming. This group currently has 17 members. In recognition of that gift, the Master Chorale re-named Grant Gershon's position the Kiki & David Gindler Artistic Director, a title that will continue. In March the Gindlers were honored at the Los Angeles Master Chorale gala for their leadership. The Music Institute of Chicago continues the 30th anniversary season of its Chicago Duo Piano Festival (CDPF) with an expanded schedule of public performances featuring international guest artists July 8–20, 2018 at Nichols Concert Hall, 1490 Chicago Avenue, Evanston, Illinois. Called a "duo piano mecca" by Pioneer Press, the world-renowned Chicago Duo Piano Festival was founded in 1988 by Music Institute of Chicago faculty members and piano duo in residence Claire Aebersold and Ralph Neiweem. Aiming to establish a project dedicated to the study of piano duo repertoire, the Chicago Duo Piano Festival has grown from a small workshop to a multifaceted annual festival. "Thinking about our early days as Chicago Duo Piano Workshop, we are gratified to see how the festival has grown into an event of international importance for fans of the piano duo," commented Neiweem. "In addition to guest piano duos from Russia and Italy, this year's festival includes a Leonard Bernstein centennial tribute concert and performances featuring some of the Music Institute's acclaimed piano faculty." Aebersold added. "Our mission continues unabated into the next decade, and we welcome everyone to share the enthusiasm by attending one of the many exciting events planned for our season of celebration." 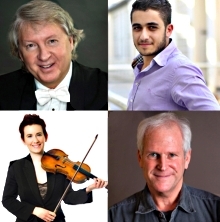 All concerts and the master class take place at Nichols Concert Hall, 1490 Chicago Ave., Evanston, Illinois. Single concert tickets are $30 for adults, $20 for seniors, and $10 for students; a 3-PASS is $60 for adults, $40 for seniors, and $20 for students. Transcendence Theatre Company and the Santa Rosa Symphony. Be amazed by the largest fireworks display in Sonoma County, CA, with our most exciting 4th of July program to date! This year Transcendence Theatre Company, best known for their "Broadway Under the Stars" performances, joins the Santa Rosa Symphony to present a show-stopping program celebrating the spirit of America! Bring the whole family--lawn tickets for kids 12 and under are half price, and kids under two are free. Families: Make sure to arrive early and check out our Kids Zone beginning at 4:30 p.m., complete with carnival games, bounce houses, face painting, plus food, music, and more. On Saturday, July 28, 2018 at 8:00pm, Spectrum presents contemporary Chinese-American pianist Jenny Q Chai in "Sonorous Brushes," a new multi-sensory program employing Chai's unique form of synesthesia. The program explores repertoire that lives at the intersection of color and sound, exploring this meeting of the senses through important works of the colorful Impressionistic era paired with new works created using Artificial Intelligence technology. In order to fully realize this concept, Chai completed a six-month residency at Cité des Arts in Paris, where she worked simultaneously on the musical performance and the paintings associated with each score. Sonorous Brushes was designed and premiered at Wigmore Hall in London on June 26, 2018. The program features Debussy Etudes Pour les huit doigts and Pour les quartes, Les tierces alternée and Feux d'artifice from Debussy's Prelude Book 2 No.11, Frédéric Durieux's Pour tous ceux qui tombent – Hommage à Ravel, Ravel's Oiseux tristes, and Messiaen's Cantéyodjayâ. The evening ends with two audio-visual works by Polish composer and Stanford University Music Department Chair, Jaroslaw Kapuscinski: Side Effects and the US premiere of Calligraphies for Ziqi. Also, Bernstein: Serenade. Hilary Hahn, violin; David Zinman, Baltimore Symphony Orchestra. Sony SK 60584. The first question one must ask of any release of an oft-recorded work like the Beethoven Violin Concerto is why? What can a new performance, especially one from an artist as young as Ms. Hahn was at the time of the recording, say that hasn't already been said by seasoned performers like Heifetz, Perlman, Kremer, Szeryng, and the rest? Or, for the audiophile, what can Sony's sound do to improve upon the catalogue's previous recordings? The answers in the case of this album are because, a little, and not a lot. This isn't to say I disliked the disc. The Beethoven is sweet, and the companion piece, the Serenade for Solo Violin, Strings, Harp and Percussion by Leonard Bernstein, is charming. In fact, it is the Serenade that works best, which is surprising considering that Ms. Hahn apparently just recently learned it before recording it here in the late Nineties, while the Beethoven has long been a staple of her repertoire (well, not too long; she wasn't very old at the time). Anyway, about the Beethoven, Ms. Hahn takes a fairly tenderhearted approach to the Beethoven, caressing the work in poetic fashion while perhaps missing the bravura elements slightly when compared to several of her elders mentioned above. She is not nearly so incisive, so electrifying, as Heifetz (RCA), for example, nor so direct yet grandiose as Szerying (Philips). She is amply supported by David Zinman, the Baltimore Symphony, and the Sony engineers as waves of big, warm, dynamic, natural orchestral sound come pouring down around her. True, she is sometimes in danger of being washed away by the sound, but she manages to hold her own. One goes away from the Beethoven with a feeling that one has heard it anew--a kinder, gentler Beethoven than one may be used to, an interpretation that is more congenial than usual. Still, it is not a disc I would recommend to first-time buyers. I would suggest one stick with the others I've mentioned, instead. On the other hand, if you really love the composer's work and are collecting different approaches to it, by all means you should go ahead. You won't be disappointed. Now, about Sony's packaging: The fold-out booklet is about as easy to manage as a road map in the wind. It unfolds to about three feet long, drooping over one's arms as one tries to read it. Thanks, Sony. For those listeners interested in what Ms. Hahn looks like, Sony has also included eight separate photographs of her: on the front cover, the back cover, and within the booklet itself. There's everything here but a poster of the lady. Maybe next time. Also, Kodaly: Concerto for Orchestra. 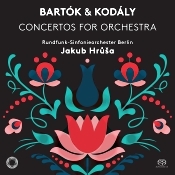 Jakub Hrusa, Rundfunk-Sinfonieorchester Berlin. Pentatone PTC 5186 626. The last time I heard a recording by Czech conductor Jakub Hrusa, he was doing Dvorak tone poems. I said at the time that I thought he was a little conservative for my taste. This time out, he is doing two concertos for orchestra by the Hungarian composers Bela Bartok and Zoltan Kodaly, both pieces requiring a red-blooded approach. While Maestro Hrusa still seems to favor a fairly cautious reading of the scores, his interpretations are undoubtedly appealing in their own way. Bela Bartok (1881-1945) wrote his five-movement Concerto for Orchestra in 1943, during the height of the Second World War. The composer was near the end of his career, and the work has since become one of his most-popular and most-accessible compositions, so he went out in style. However, the title of the piece is something of a misnomer because the music's form doesn't really resemble a traditional concerto. Bartok's Concerto is in five movements instead of the conventional three, and it involves no solo instruments. He said he called it a "concerto" because of the way the score treats each section of instruments in "a soloistic and virtuosic way." Fair enough. Bartok's concerto begins with some soft, light "night music," giving way to more robust themes as things move along. The second movement, titled "Game of Pairs," has a different pair of instruments playing together in five sections. The middle movement is a slow elegy, also of the "night music" variety, a sorrowful lament. The fourth movement is an Allegretto, a smoothly flowing affair, which includes much folk music as well as a reference to Lehar's Merry Widow (although the composer claimed never to have heard the operetta, only Shostakovich's play on it). The work concludes with another big movement, labeled Finale - Pisante (heavy or ponderous), which most conductors nevertheless take at a moderately quick, high-spirited pace. I like the way Hrusa opens the concerto; it's appropriately mysterious, even eerie. Then he takes an almost lyrical approach to the big melodies, which is pleasantly refreshing if slightly unexpected. Tempos throughout are leisurely, relaxed, though not sluggish. I was hoping for more bite, but it never materialized. There is an agreeably sedate playfulness about Hrusa's "Pairs" that seems in tune with the occasion. Next, Hrusa's third-movement elegy is in part haunting and in part dragging. It's actually a hard act to pull off, so I'd give him credit for trying. I liked Hrusa's treatment of the fourth movement; perhaps it's the conductor's own love of folk music that carries the day. The orchestra, too, responds splendidly to the light rhythms. In the finale, Hrusa lets go a bit more, even if he's still somewhat tame compared to some other conductors. I know that a lot of readers would prefer that I not compare recordings to one another at all, that I should judge each new disc on its own merits alone. But I've never been able to do that. Other, favored recordings always come to mind as I'm listening to something new. So, for me the question arises, Is Hrusa's performance (and Pentatone's sound) any better or worse than my old standbys in the Bartok: Fritz Reiner's interpretation (RCA or JVC remasters) or either of Georg Solti's renditions (Decca)? I'd say Hrusa's reading is smoother, softer, gentler than either of my comparisons. Reiner is more acute, more incisive, and Solti is bolder and more brusque. I suppose it's just a matter of how you like your Bartok; personally, I still prefer the older recordings. Zoltan Kodaly (1882-1967), a friend, contemporary, and fellow countryman of Bartok, wrote his own Concerto for Orchestra in 1939-40, a few years earlier than Bartok's concerto. Kodaly's work has never attained the level of popularity that Bartok's has, and it is much shorter, a single movement divided into five brief segments. That said, it does have its charms. As Jorg Peter Urbach writes in a booklet note, it's "a captivating combination of Baroque 'architecture' and Hungarian folk music." Hrusa gives it his full attention, and like his realization of the fourth movement of the Bartok, the performance displays a brisk bounce and sensitivity. Producer Job Maarse and engineers Jean-Marie Geijsen and Erdo Groot recorded the concertos at Haus des Rundfunks, Berlin in June 2017. They produced it for playback via hybrid SACD, so one can play it in multichannel or two-channel SACD on an SACD player or in two-channel stereo on a regular CD player. As usual, I listened in two-channel SACD, using a Sony SACD player. The sound is typical of Pentatone in that it's warm and luxuriant, with a nice sense of ambient bloom that doesn't overshadow all of the music's detail. Orchestral perspective and depth of field are reasonably good, as are the dynamic range and frequency response. In other words, the sound may not be entirely what audiophiles expect, but it is acceptably realistic and easy on the ear. The 9th annual ABS Festival & Academy will take place August 3–12, 2018 in the San Francisco Conservatory of Music and San Francisco's Saint Mark's Lutheran Church. 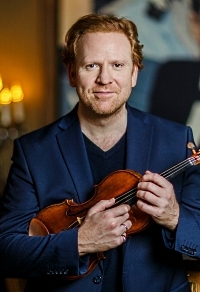 Each summer festival focuses on a different aspect of the world of Baroque music, and for 2018, ABS Artistic Director Jeffrey Thomas has chosen the music of Germany with a particular emphasis on "The Glorious Court of Dresden," known for the extraordinary quality of music that was composed for the electors and kings of Saxony who upheld the highest artistic and cultural standards for their subjects. Its splendid Baroque and Rococo architecture brought the city its nickname as the "Jewel Box," and a distinguished roster of performers and composers made it one of Europe's most important musical capitals. A full array of free events--including public master classes, lectures, concerts, and colloquia--complement the performances by American Bach Soloists in two exceptionally fine venues. The beloved Mormon Tabernacle Choir makes a special stop in Sonoma County as part of their 2018 Classic Coast Tour. The performance will center around works from the Choir's vast repertoire, which ranges from choral masterworks to inspirational music from around the world to American folk hymns, spirituals, and much more. Composed of 360 volunteer voices, and the Orchestra at Temple Square, a 150-piece, all-volunteer symphony orchestra, the Mormon Tabernacle Choir is a rich celebration of the choral tradition--an event the whole family can enjoy. The pioneering International Contemporary Ensemble (ICE) returns to Lincoln Center's 2018 Mostly Mozart Festival for its eleventh consecutive season with four unique programs August 2-9, 2018. Having performed annually at the Mostly Mozart Festival since 2008, ICE was named Artist-in-Residence for the festival in 2011. On Thursday, August 2, 2018 at 6pm in Bruno Walter Auditorium, composers Courtney Bryan, Ashley Fure, George Lewis, and Michael Pisaro, whose works will be performed during the Mostly Mozart Festival, join members of ICE for a free discussion hosted by WNYC's John Schaefer on their works, the creative process, and the future of classical music. Seating is available on a first-come, first-served basis. Later on Thursday, August 2, 2018 at 7:30 pm, ICE performs Grand Pianola Music at the Gerald W. Lynch Theater at John Jay College. John Adams's groundbreaking work Grand Pianola Music is the centerpiece of this spirited celebration of the piano and technology. This year, in addition to our regular season of concerts, we at Experiential Orchestra are dedicating ourselves to a singularly exciting project, as we have been granted permission to become the first orchestra in history to create a commercial recording of Dame Ethel Smyth's final masterpiece, The Prison, composed in 1930. We are thrilled to share this short video with you! and feel free to share on Facebook, Twitter, email, typewriter or otherwise. For too long, Dame Ethel Smyth has been virtually unknown as a serious composer. By creating this recording with renowned soloists Sarah Brailey and Dashon Burton, the Experiential Orchestra, and members of the Clarion Music Society, we hope to bring her music to international attention by letting the quality of her work speak for itself. The season includes concerts featuring Fire & Grace, Les Délices, Aizuri Quartet, and Pianist Martin Katz. Five Boroughs Music Festival (5BMF) announces programming for its 2018-2019 season, continuing its mission of bringing affordable, world-class performances of traditional and contemporary chamber music to all five boroughs of New York City. The upcoming slate of concerts marks the organization's most collaborative season to date, including partnerships with GEMAS (Gotham Early Music / Americas Society), ClassicalCafé, Brooklyn Art Song Society, New York Festival of Song, and the LGBT Center ("The Center"). Unison Media's acclaimed concert series The Crypt Sessions continues its third season on July 24, with a one-of-a-kind performance by tenor Lawrence Brownlee, accompanied by three of today's top pianists: jazz giant Jason Moran, leading classical accompanist Myra Huang, and gospel great Damien Sneed. Showcasing Brownlee's broad musical range and tastes, the wide-ranging program will include spirituals, standards, arias, songs from Schubert's Dichterliebe, and a movement from Cycles of My Being, the acclaimed song cycle composed for Brownlee by Tyshawn Sorey with lyrics by Terrance Hayes. Each Crypt Session will feature a pre-concert reception of food and wine, included in the ticket price, before descending together into the Crypt. All proceeds from ticket sales of The Crypt Sessions are donated to the Church of the Intercession, NYC, where the Crypt is located. Free is good! Especially when considering all the ABS Festival activities that are free and open to the public, like Public Colloquia, Baroque Marathon, Lecture Series, and Master Class Series. All free events will take place in the San Francisco Conservatory of Music, so mark you calendars now for interesting, informing, intriguing, and inspiring interactions with our Festival & Academy participants. Sunday, June 24 from 2:00 - 4:00 p.m.
Choristers from the Young People's Chorus of New York City will be joined by young singers from 15 other youth choruses from China, Finland, Ireland, and six U.S. states for a DCINY 10th anniversary concert at Carnegie Hall. The concert will be highlighted by world premiere works composed and conducted by Francisco J. Núñez, artistic director/founder of the Young People's Chorus of New York City, and Venezuelan composer/conductor Cristian Grases. Mr. Núñez conducts the world premiere of "Liminality," a meditation on time and human awareness, along with several of his other works: "Forever is My Song," "Naturaleza," and "Es Tu Tiempo." "Liminality" is a DCINY Premiere Project composition. Various soloists, conductors, and orchestras. RCA 74321 72916 2.
ast sixty-plus years, the collection contains practically every major number even the dedicated operetta buff could list off the top of his head. The program, which, by the way, is arranged like a mini operetta in itself, begins with the overture to Strauss's Die Fledermaus, played by old-hand Robert Stolz with the Vienna Symphony. It zips along with grace and exuberance, properly setting the stage for the songs to come. There are nineteen selections all told, and among them are Strauss's "Als flotter Geist" sung by Fritz Wunderlich, Lehar's "Lippen schweigen" sung by Montserrat Caballe, Flotow's "M'appari" sung by Placido Domingo, Strauss's "Komm in die Gondel" sung by Ruolf Schock, Lehar's "Vilja-Lied" sung by Margit Schramm, Offenbach's "Dites-Lui" sung by Frederica von Stade, and Lehar's "Wolgalied" sung by Jerry Hadley. You're probably getting the picture. 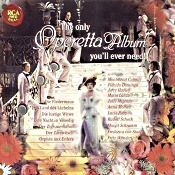 The operettas represented are things like Strauss's Der Zigeunerbaron ("The Gypsy Baron") and Eine Nacht in Venedig ("A Night in Venice"); Flowtow's Martha; Offenbach's La Grande-Duchesse de Gerolstein ("The Grand Duchess of Gerolstein") and Orphee aux Enfers ("Orpheus in the Underworld"); Lehar's Das Land des Lacheins ("The Land of Smiles") and, of course, Die lustige Witwe ("The Merry Widow"). 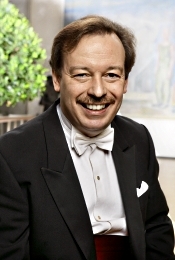 Then in the middle of the program, there is a second purely orchestral interlude, this time of ballet music from Strauss's Die Fledermaus, also conducted by Robert Stolz. Understandably, the sound varies slightly from one track to another, yet the whole set is remarkably uniform in overall quietness and sheen. About the only tune that stands out sorely is Wunderlich's second number, "Ach, wie so herrlich zu schauen," which tends to be louder, especially in the vocal, than the other pieces. Every item but one, Mario Lanza singing Lehar's "Yours is My Heart Alone," is in stereo. But even the Lanza mono sounds good. If you don't already own these works, or if you just long for the convenience of having them on a single disc, this is as good a way as any to get them. Also, Wagner: Lohengrin Prelude. 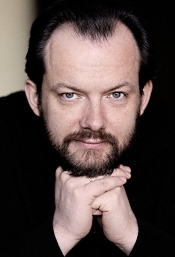 Andris Nelsons, Leipzig Gewandhaus Orchestra. DG 479 7577. I may be the only the person left on the planet who is not 100% enamoured of live recordings. 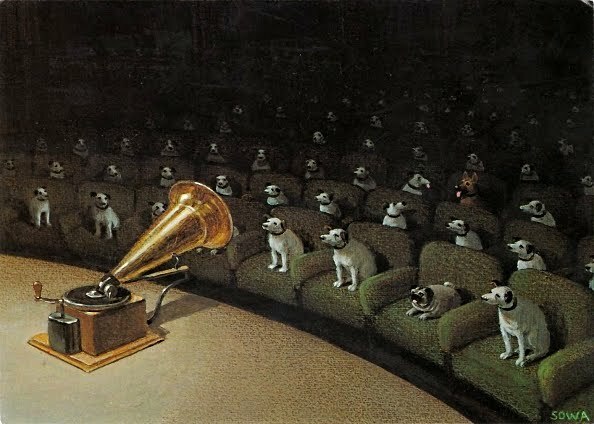 I keep reading reviews of live recorded performances that say how wonderful the sound is, how the audio engineers should be nominated for Grammys, and so forth. Sorry; I don't hear it. Even when a live recording is done well, as this one is with the applause edited out, I often find the microphones too close, the sound too mechanical and flat, and audience presence still too noticeable, especially during quiet moments. Yes, I understand the economic needs for recording live, and I respect a conductor's desire to capture the spontaneity of a live performance; but it doesn't mean I have to like the sound, which in almost every case would have been better if done in a studio. Latvian conductor Andris Nelsons is, as of 2018, the Music Director of the Leipzig Gewandhaus Orchestra, one of the oldest and most prestigious orchestras in the world. 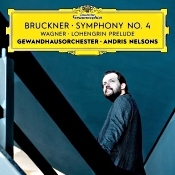 In 2017 Maestro Nelsons embarked on a Bruckner symphony cycle with the Gewandhaus players, and the current Fourth Symphony is the third such effort (following the Third and Seventh Symphonies). Critics received his previous releases favorably, and I see no reason why they wouldn't do the same here. It's a mature account of what is possibly Bruckner most-popular music. Anton Bruckner (1824-1896), Austrian composer and organist, wrote the Symphony No. 4 in E flat major "Romantic" in 1874, revising it several times before his death. (Maestro Nelsons uses the familiar 1878-80 revision edited by Leopold Nowak in 1953). No doubt, audiences like the work's abundance of Romantic, programmatic qualities. Bruckner was a deeply spiritual man, and his symphonies illustrate the point. The composer goes further by telling us what each of the symphony's movements represents, from knights riding out of a medieval castle through the mists of dawn to the sounds of the forest and birds, to a funeral, then a hunt, complete with horn calls, and finally a brilliant culminating summation. Still, the real question about any new recording is whether the conductor brings to the performance anything new, anything we haven't heard before, anything that might set it apart from the many fine recordings that have come before it. To my mind and ear, we already have fine performances by Otto Klemperer (EMI), Karl Bohm (Decca), Eugen Jochum (DG and EMI), Gunther Wand (RCA), Herbert von Karajan (DG), and Georg Tintner (Naxos), among others. So, does Nelsons compare? Maybe. In the first movement Bruckner offers us a vision of Nature, and the composer's several scenic landscapes should remind us of how much Bruckner admired Beethoven and Wagner. Here, according to the composer, "...after a full night's sleep the day is announced by the horn." Other authorities have argued that the composer wanted us to see a morning breaking, the mists giving way to dawn around a medieval castle, and an army of knights bursting out from the castle gates in a blaze of glory. Whatever, Nelsons does a good job establishing the atmosphere and maintaining the mystery of the score, accenting the mystical side of the music rather than the purely programmatic. The second-movement Andante is a serenade, sometimes described as representing a young lad's amorous but ultimately hopeless longings and expressions. 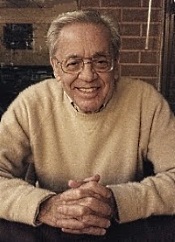 Nelsons, however, says that "This movement is like a song or a prayer" and it reveals "a genuine, intimate connection with God." Fair enough. I've always thought it sounded elegiac, halfway between a nocturne and a funeral march, the composer indicating he wanted something between a moderately slow but still comfortably forward pace (Andante quasi Allegretto). Nelsons, in an apparent effort to accommodate his own view of things, adopts a very slow tempo for it, more like an adagio. Where most conductors take about thirteen or fourteen minutes to cover the movement, Nelsons goes over seventeen. The listener may either appreciate the added beauty or find the length interminable. I can't say I preferred it over more traditional readings, but, then, I may simply have to get used to it. The lively third-movement Scherzo Bruckner teasingly called "a rabbit hunt," and it should build a proper momentum as it goes forward. I thought Nelsons was at his best here. The music rollicks. The Finale opens with a heroic theme, then works its way into a more idyllic second subject, eventually reworking both themes into a closing statement. This movement begins rather ominously, with dark clouds overhead, leading to a thunderstorm; however, the storm soon breaks and gives way to variations on the symphony's heroic opening music and a summation of all the parts. If you're wondering what it means, not even Bruckner was sure. He said, "...even I myself can't say what I was thinking about at the time." Nelsons tells us that "The music is like a glimpse of heaven," which may explain why he takes the final movement so deliberately. As with the second movement, the listener may enjoy the conductor's pace or find it too fragmented or sluggish. I would have liked a bit smoother forward progress and a bit more resolute determination. Along with the symphony is the piece that opens the program, Richard Wagner's Prelude to Act I of Lohengrin, premiered in 1850. Nelsons, of course, wants us to see (hear) for ourselves the influence of Wagner's music on Bruckner, particularly the ethereal, religious elements, so, given his approach to the symphony, it's not a bad way to begin things. He handles it well. Executive producer Sid McLauchlan and recording producer and engineer Everett Porter recorded the music live at the Gewandhaus Leipzig in May 2017. As I said at the start, one can take or leave a live recording. My own prejudice is to leave it, even when done as well as here. Like most other live recordings, in this one the microphones are a little close, resulting on the positive side in a reasonably detailed response with very wide dynamics and on the negative side a somewhat forward sound picture with an emphasis on the upper midrange and some odd instrumental relationships. Take the opening of the symphony, for instance. The horn solo appears admirably well focused, while one can barely hear the orchestral accompaniment. Otherwise, the sound is fairly warm (if a tad hard, edgy, and pinched in louder passages), ambient, and realistic. Still, it doesn't quite capture the Gewandhaus's characteristically dark, golden glow as well as I've heard it in many studio productions. Have You Planned Your Holiday Concerts? American Bach Soloists have planned two stellar events in December: Handel's Messiah in San Francisco's Grace Cathedral and "A Baroque New Year's Eve at the Opera." Handel's timeless masterpiece will be presented for the 21st consecutive year in the awe-inspiring majesty of Grace Cathedral. 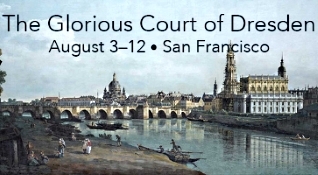 Perennially a sold-out event, audience members from far and wide attend this Bay Area favorite that features the superb American Bach Choir and the period-instrument specialists of ABS in one of their largest configurations, under the direction of Jeffrey Thomas. Praising his performances of Handel, Opera News wrote "Jeffrey Thomas draws crisp, vital playing from the ace baroque instrumentalists of American Bach Soloists." An annual holiday tradition, these performances meld together Handel's glorious music with the serene beauty of one of San Francisco's greatest architectural treasures. "A Baroque New Year's Eve" will be presented in San Francisco's beautiful Herbst Theatre--a cornerstone and jewel among the city's most prestigious venues--will feature one of the opera world's exciting new vocal talents, countertenor Aryeh Nussbaum Cohen. The 2017 Metropolitan Opera National Young Artists Award Winner, former Merola Opera Program participant, 2018 San Francisco Opera Adler Fellow, and ABS Academy alumnus has been capturing the hearts of opera lovers around the world and will be featured in arias by Handel and Gluck. Joined by the incomparable soprano Mary Wilson, and along with a delightful program of instrumental music from opera and concert, this early night on the town will joyfully ring in the New Year in elegant style. Monday, December 31, 2018. 4:00 p.m.
With audiences growing and reviews overwhelmingly positive, the Basque National Orchestra has extended - after only one year - Robert Trevino's tenure as Music Director. The fast-rising American conductor made an immediate impression upon his arrival and forged a strong partnership with the orchestra's General Manager Oriol Roch. The new contract will see Trevino as the orchestra's artistic leader until the 2021/22 season. 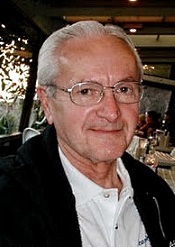 As the start of his time with the orchestra, Trevino spoke of his determination to strive with the players to achieve the highest standards of music-making for the Basque Country and beyond, critics have been quick to enthusiastically note the results, with Klassikbidea opining, "Trevino is taking this orchestra to very high levels of quality and his appointment there is a success that we hope will be extended for many seasons...He approaches music as an active experience, as a journey in which each length is questioned and illuminated." On reporting the news of the contract extension, that same outlet commented, "(There was a) fear that the American maestro might not finish his first contract in view of the volume and the quality of his international commitments...The orchestra can make a lot of progress with Trevino...Basque fans are in luck. Trevino is invaluable..."
Works by Bach and Chopin. Don't miss a night of scenes from your favorite operas! Our Opera Apprentice singers perform an intriguing program of opera and operetta dating from the inception of the art form to current works. Enjoy a double bill evening with two one-act classic operas: Dido and Aeneas, based on the legendary love story between the Queen of Carthage, Dido, and the Trojan prince, Aeneas; and The Medium, a modern work about Baba, a psychic who hosts seances that trick bereaved parents into spending their money. Carnegie Hall's NYO2 makes its New World Center debut alongside Grammy Award-winning violinist Gil Shaham and NWS Fellows and alumni for an exclusive one-night-only event—the orchestra's only public performance before its finale at Carnegie Hall on July 24. NYO2 is joined by conductor Carlos Miguel Prieto for Mexican and Russian masterpieces, including the vibrant suite from Revueltas's Redes, Prokofiev's rich First Violin Concerto and Shostakovich's dramatic Symphony No. 5. The Television Academy has announced 155 nominations in 47 categories for the 70th Los Angeles Area Emmy Awards. Composer Lisa Bielawa and director Charles Otte are nominees for their work on VIREO: The Spiritual Biography of a Witch's Accuser, the first episodic made-for-TV & online opera. Bielawa is nominated in the Creative Technical Crafts--Composer category and Otte's nomination is for Outstanding Director--Programming. Typically, concertos have a been a way to showcase the virtuosity of a soloist (every so often, multiple soloists) set against the spectacular, multi-dimensional canvas of an orchestra. Typically. But there is little that is typical about the Kosmos Ensemble. They are, indeed, a brilliantly untypical ensemble, who play untypical repertoire and with an untypical philosophy. The violinist (Harriet Mackenzie), violist (Meg Hamilton). and accordionist (Milos Milivojevic) who comprise Kosmos (who have, individually and collectively, virtuosity to spare) are fascinated to explore the relationships between classical, folk and world musics. Errollyn Wallen - one of the UK's most in-demand composers - has similarly been much-admired for her wide stylistic palette and her ability to somehow connect different musical worlds in ways that make perfect sense. So Wallen's new "Concerto for Kosmos and Orchestra" was always going to be about more than virtuosity. The piece becomes a conversation about what music is and where it comes from, right there on the stage. Traditionally, concertos would have had an element of improvisation for the soloists, even if that was just a cadenza. Errollyn has been brave enough to let us improvise in the concerto, giving us a tangible freedom. So in this piece, I feel there is a real sense of continuing and expanding traditions as well as challenging and expanding boundaries. It's fantastically exciting to play and, we hope, to hear!" 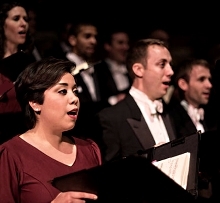 Premieres: Arturo O'Farrill's "Borderless" and Paola Prestini's "The Glass Box"
Young People's Chorus of New York City and Yale Choral Artists come together for a compelling concert at Kaufman Music Center's Merkin Concert Hall. The program is highlighted by the world premiere of "Borderless," a YPC commission from six-time, Grammy-winning Latin jazz composer Arturo O'Farrill featuring the Haven String Quartet, and the New York premiere of "The Glass Box," a YPC-Yale Choral Artists co-commission from the visionary composer/impresario Paola Prestini and Pulitzer Prize-winning librettist Royce Vavrek, set to dramatic visuals by Kevork Mourad. Monday, June 18 from 7:30 - 9:30 p.m. The 8:00 p.m. concert will be preceded by a discussion at 7:30 p.m. moderated by YPC Artistic Director/Founder Francisco J. Núñez, about the relevance and importance of music in today's society. Also, The Tempest, Suite No. 1. 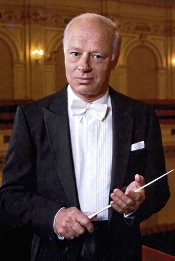 Petri Sakari, Iceland Symphony Orchestra. Naxos 8.554266. What, you say you don't want to lay out thirty bucks for the Barbirolli gold disc of the Sibelius Second on Chesky? OK, how about considerably less money for this pleasant little Naxos release? It isn't the ultimate in refinement or interpretive flair, but it is a good, solid performer. The Symphony No. 2 in D major, Op. 43 by Finnish composer Jean Sibelius (1865-1957) is perhaps the man's most popular work, outside of the ubiquitous "Finlandia," and there are many fine recordings of the symphony available. If you already own a favorite (the aforementioned Barbirolli disc for me), you may stop reading now and continue on with the next review. If, on the other hand, you are new to Sibelius or you are exploring alternative readings, this medium-priced issue seems a good investment. 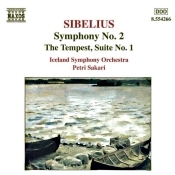 Maestro Petri Sakari and the Iceland Symphony Orchestra handle the first movement especially well, conveying a proper, shivery introduction leading up to a probing major subject. If there is any minor disappointment, it is in the heroic final theme, which sounds a bit too homogenized for my taste. For an unfair comparison here, try Herbert von Karajan, the master of the grand gesture, on EMI, and Sakari will seem positively staid. But it isn't so bad in context and should not distract one from a possible purchase. In sum, Sakari and his forces provide an ardent and colorful journey through Sibelius's characteristic landscape. Plus, the inclusion of the first suite of tunes from Sibelius's incidental music to Shakespeare's The Tempest makes a good companion piece. Sakari's interpretation brings out much of the music's imagination and color. The sound likewise is pretty good, although not in the absolute top class. There is a pleasing concert hall ambience present that enriches verisimilitude while doing relatively little harm to detail clarity. It's rich, smooth, and resonant. And the music for The Tempest sounds equally fine. This disc may not carry the mark of authority manifest by conductors like Sir John Barbirolli, Herbert von Karajan, Sir Colin Davis, or Vladimir Ashkenazy, but it is fair value for the dollar. Also, Funf Menuette mit sechs Trios. Isabelle Faust et al. Harmonia Mundi HM 902263. As I've rhetorically asked before, Was there ever a writer of more charming, more thoroughly delightful music than Austrian composer Franz Schubert (1797-1828)? Whether it's his symphonies, his songs, his chamber music, his church music, his incidental music, or his stage pieces, it's all so enjoyable it's a wonder he wrote so much of it in so short a time (he died at age thirty-one). And it's an even greater shame that so few people in the composer's lifetime got the chance to hear his work. Still, the years since his death have proved his worth, and the invention of the phonograph further cemented his place in musical history. On the present album, we have one of his crowning achievements, the Octet in F major D.803, for clarinet, horn, bassoon, two violins, viola, cello, and double bass, which Schubert wrote in 1824 on commission from clarinetist Ferdinand Troyer. The fact that Troyer asked for a piece patterned after Beethoven's Septet, Op. 20 and that Schubert delivered an octet instead (adding a second violin) probably just proves how creative and resolute Schubert could be. In order to get to the heart of the work, the renowned German violinist Isabelle Faust here interprets the Octet in a presentation featuring period instruments (she herself plays the Stradivarius "Sleeping Beauty," 1704). 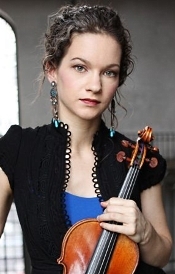 Her ensemble includes Anne Katharina Schreiber, violin; Danusha Waskiewicz, viola; Kristin von der Goltz, cello; James Munro, double bass; Lorenzo Coppola, clarinets; Teunis van der Zwart, horn; and Javier Zafra, bassoon. Anyway, Schubert divided the Octet into six movements, the first one based on a theme from his song "Der Wanderer" and the fourth movement variations on a theme from his Singspiel "Die Freunde von Salamanka." Ms. Faust and company provide a loving and enthusiastic interpretation that well captures the joy of Schubert's music. The two slow sections--the Adagio and Andante--are poignant, and I especially liked the sweetness of the variations in the latter movement (so similar in spirit to those of the "Trout" quintet). The ensemble plays the scherzo in appropriately playful fashion, and they ensure the finale is as big and dramatic as it should be without overshadowing its good cheer. 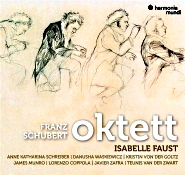 As a historical performance, Ms. Faust's recording comes into direct competition and comparison with one of my longtime favorites, that by Hausmusik (EMI), recorded in 1990. In the opening movements, Hausmusik are marginally more lively and spontaneous, but by the last movements Mr. Faust and her company appear almost equally felicitous. Sonically, the earlier disc is a bit more transparent, but certainly the warmer acoustic of the Harmonia Mundi disc flatters the music in its own way. To accompany the Octet Ms. Faust and her friends offer two of Schubert's Five Minuets D.89, from 1813, arranged for octet by Ms. Faust's friend, the composer, conductor, and pianist Oscar Strasnoy. These are hardly trifling pieces, and the present group help them attain what one might call at least a measure of apt nobility. Artistic Director Martin Sauer and engineer Tobias Lehmann of Teldex Studio Berlin recorded the music at Mediapole Saint-Cesaire, Arles, France in July 2017. The sound, as I mentioned above, displays a warm, ambient glow that nicely complements the warmth of Schubert's music. It's a tad close for my liking but captures instrumental color well enough. There is also a moderate sense of depth to the ensemble as well as space around the instruments. If played back at a realistic level, the recording sounds most enjoyable. American Classical Orchestra (ACO) today announces its programming for the 2018-19 season, the orchestra's 34th year of presenting historically accurate, engaging, and educational concerts led by Artistic Director and Founder Thomas Crawford. ACO performs four concerts presented in Alice Tully Hall at Lincoln Center and two salon concerts in a private venue. ACO is joined this season by an illustrious group of acclaimed period-performance soloists including violinists Krista Bennion Feeney and Aisslinn Nosky, pianist Christian De Luca, and flutist Sandra Miller. American Classical Orchestra continues its innovative Concert Preview that brings listeners closer to the music. Before conducting the programmed works, Maestro Crawford delivers an introduction, using the full orchestra on-stage to illustrate and perform excerpts from the evening's program. Crawford's engaging narratives, along with the live music, give audiences greater insights into what they're about to hear, resulting in a more enriched musical experience. ACO kicks off its 2018-19 season on Wednesday, September 26, 2018 at 8:00pm in Alice Tully Hall at Lincoln Center with Mozart Serenade, featuring festive music by Mozart. ACO is joined by violinist Krista Bennion Feeney in Mozart's Haffner Serenade, an hour-long work performed interspersed throughout the evening, as it would have been done in the 1700s. Pianist Christian De Luca, a virtuosic Juilliard historical performance masters student, makes his Lincoln Center debut on fortepiano in Mozart's Piano Concerto No. 21 in C Major. fortepianist Christian De Luca, and flutist Sandra Miller. The American Bach Soloists 30th Season commemorates the core of ABS's rich history through stunning performances of works that represent the finest of the Baroque era. Grand special events including the "Sparkle 2018 Gala" and "A Baroque New Year's Eve at the Opera," a glamorous evening of stars in San Francisco's Herbst Theater, make this an unparalleled celebratory season of the organization's past, present, and future. For three decades, a synthesis of the musical and expressive gifts of some of the world's most distinguished Baroque music experts and new generations of young virtuosi has inspired audiences far and wide through polished, insightful, and revelatory performances. Together, and through the mentoring and curatorship of Jeffrey Thomas, American Bach Soloists have cultivated an internationally appreciated and cherished ensemble of extraordinary musicians. Columbia Artists is proud to announce multiple Grammy winner Sharon Isbin's summer highlights include performances at Caramoor, the Aspen Music Festival, and Chautauqua's Ampitheater where she will perform the concerto written for her by John Corigliano. She returns to the studio to record a disc of world premiere recordings of works commissioned for her including the "thoughtful, emotionally complex, and technically extraordinary" new concerto by Chris Brubeck, and a recording with the Pacifica Quartet. The 2018/19 season features solo and concerto appearances, and chamber concerts with the Pacifica Quartet, Latin Grammy-winning Brazilian jazz guitarist Romero Lubambo, and her Guitar Passions trio with jazz icon Stanley Jordan. Statistics demonstrate how limited the repertoires of our major orchestras are, and how much they mirror one another. We believe this is a contributing factor in the decline in subscription sales at many symphony orchestras. When faced with this information, one reader suggested that it could make sense for orchestras to program more unfamiliar works of favorite composers--with the goal of creating an "enjoyment of novelty" that might make audiences more receptive to composers with whom they are less familiar--such as Meyerbeer and Spohr, or composers of our time. Bach, Beethoven, Haydn, and Mozart wrote great quantities of music, much of it magnificent, that is hardly ever heard in symphony programs. Were "fringe" items such as these offered more frequently, audiences might well become more receptive to a broader range of sound worlds. What do you think? We at Classical Music Repertoire Project would be curious to know what ideas you have for encouraging orchestras to expand their repertoires, and for reassuring them that audiences will support the effort. The St. Charles Singers, conducted by founder and music director Jeffrey Hunt, will present the world premiere of a new work written for them by revered English composer and choirmaster John Rutter when the professional chamber choir performs June 21, 2018, in a concert hosted by Chorus America, a choral music association, during its national conference in Chicago, IL. The concert, which will showcase three Chicago-area choral groups, will be at 8 p.m. on Thursday, June 21, at Old St. Patrick's Church, 700 W. Adams St., Chicago. In addition to the St. Charles Singers, Anima-Glen Ellyn Children's Chorus, and Cantate Chicago also will perform. Tickets, available to the public, are $20 and can be purchased online at www.stcharlessingers.com or by calling (630) 513-5272. Rutter, a superstar in the choral music world, is a friend and fan of the St. Charles Singers and has conducted the choir on several occasions in the U.S. The new piece, for unaccompanied mixed-voice choir, is a setting of William Shakespeare's romantic Sonnet No. 18, "Shall I Compare Thee to a Summer's Day?" Miami Music Festival (MMF), an intensive training program for the next generation of classical musicians to work with mentors and gain performing experience, announces the lineup for the 2018 season from June 5 through July 29, 2018 at various venues in Miami. Going into its fifth season, MMF will host young artists from around the world selected from top conservatories and universities. This season will include musical milestones such as the return of MMF's POPS Concert and Independence Day Celebration after a successful first year and the directorial debut of Antoine Wagner, great grandson of famed German composer Richard Wagner, as the MMF critically acclaimed Wagner Institute stages complete Acts from Lohengrin and Die Walküre. The Festival will present over 45 public events this summer including the MMF Wagner Institute, full opera productions, symphonic concerts, piano performances by guest artists, numerous piano recitals and chamber music performances by MMF participants, Opera Aria Nights, Zarzuela in the Summer Nights, Broadway Nights, Faculty Chamber Series, more than 30 masterclasses, and more. Young People's Chorus of New York City and Yale Choral Artists come together for a compelling concert at Kaufman Music Center's Merkin Concert Hall. The program is highlighted by the world premiere of Borderless, a YPC commission from six-time, Grammy-winning Latin jazz composer Arturo O'Farrill featuring the Haven String Quartet, and New York premiere of The Glass Box, a YPC-Yale Choral Artists co-commission from the visionary composer/impresario Paola Prestini and Pulitzer Prize-winning librettist Royce Vavrek, set to dramatic visuals by Kevork Mourad. Long Yu, China's pre-eminent conductor on the international scene, and the Shanghai Symphony Orchestra (SSO) have signed an exclusive contract with Deutsche Grammophon. The new partnership is set to build on Long Yu's critically acclaimed work as Music Director of the SSO and help promote the orchestra's powerful blend of tradition and ambitious future vision. It will also enhance the SSO's "Music Connecting Worlds" ethos. Their first DG recording, an album of works from the Chinese and Russian repertoires, will be released in 2019 to mark the SSO's 140th anniversary and celebrate its status as China's earliest symphony orchestra. In addition to making new albums with the orchestra, Deutsche Grammophon will also release earlier recordings from the SSO's existing catalogue. Philharmonia Baroque Orchestra's 2017/18 season was outstanding from beginning to end. We experienced dramatic performances by virtuosic concertmaster Elizabeth Blumenstock who led a program of fast-paced Vivaldi violin concertos, Nic brought his interpretation of Handel's rarely-heard Joseph and his Brethren, violoncellist Steven Isserlis wowed us with a dramatic program of Haydn, and guest maestro Richard Egarr took us a journey of works by Corelli and Handel. And Nic brought the season to a spectacular Beethovenian finish! Thank you for being a part of this past year's musical journey. In addition to our regular concerts, PBO also presented three PBO SESSIONS programs. We began with Female Composers and the Women Who Bring Their Music to Life with Caroline Shaw, followed by Jewish Songlines, an exploration of Jewish music and heritage at the Contemporary Jewish Museum with Steven Isserlis and Francesco Spagnolo of the Magnes Collection at UC Berkeley. And finally, maestro Richard Egarr took us on a guided tour of music by Arcangelo Corelli and his influence on Handel in "Corelli the Godfather" at ODC. The 2018/19 Season is on sale now! You only need 3 concerts to become a subscriber and pricing starts at just $91. There's no better way to experience Philharmonia Baroque Orchestra & Chorale than as a season subscriber. Also, In the Fen Country; On Wenlock Edge. Ian Bostridge, tenor; Bernard Haitink, London Philharmonic Orchestra. EMI 7243-5-56762-2. 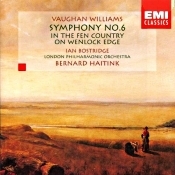 Bernard Haitink's 1999 release of Vaughan Williams's Symphony No. 6 (EMI, now Warner Classics) is a good illustration of why record reviewing can sometimes be frustrating, especially if a reference disc is not handy. On its own, Haitink's interpretation appears competently together, well focused, unified, and, as always, straightforward. As Haitink does in most of his performances, he allows the music to speak for itself, seldom straying from the letter of the score. Then I put on a favorite old recording of the Sixth, in this case the one by Sir Adrian Boult (also on EMI), recorded exactly thirty years earlier. Why Boult? He premiered the work in 1948, so one supposes he knows a little something about it. Under Boult, the music has more warmth than under Haitink, not just sonically but interpretively, a broader, more loving gait, a sense of real communication between conductor and audience. This is nothing that one can adequately explain in words. It is a feeling one has to experience, and a direct comparison is the easiest way to hear it. Otherwise, one has only a vague notion that "something" is missing somewhere in the Haitink account, as good as it is. Make no mistake, however. Haitink does offer up a fine performance. It's one that most fans of Vaughan Williams will enjoy. And because of Haitink's usual precision and sharpness of focus, it's a performance that belongs at or near the top of any list of recommendations. The thing is, though, that it's also hard to dismiss Boult, not that most listeners have to make the choice. Sound has a lot to do with it, too. The newer, digital EMI/Warner Classics is marginally cleaner and clearer than the older, analogue Boult recording, yet at the same time the newer disc appears colder, harder, and less inviting. The older recording is richer and provides more bloom, which may affect one's judgment of the two discs, as it did mine. How much did the warmer, softer, older recording of Boult's slower-paced performance influence my appreciation of it over the newer one? I'd guess enough. What if the newer reading had had the older sound? Who knows. In any event, Haitink's companion works on the disc, the tone poem "In the Fen Country" and the song cycle "On Wenlock Edge" (based on poems by A.E. Housman), are more readily up my alley and display a sweetness of spirit and a bent for the color of the Vaughan Williams countryside that I found slightly wanting in the symphony. So, if it's the shorter pieces one is looking for, yes. If it's the symphony, maybe not as much. Stick with either Haitink or Boult, though, and you can't go wrong. Also, Images. 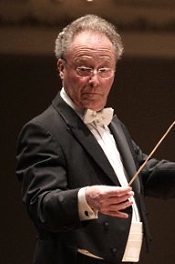 Emmanuel Krivine, Orchestre national de France. Erato 0190295687045. The last time I heard a recording from French conductor Emmanuel Krivine, it was Rimsky-Korsakov's Scheherazade with the Philharmonia Orchestra on Denon, a performance I found beautifully lyrical and engaging. But that was over a quarter century ago. Although Maestro Krivine has continued with a distinguished career in the concert hall and recording studio, he hasn't quite been front and center in the general public's eye. Nevertheless, he currently holds the position of Music Director of the Orchestre National de France, with which he recorded the current Erato disc of Debussy's La Mer and Images. It was good to reacquaint myself with him. French impressionist composer Claude Debussy (1862-1918) wrote La Mer between 1903 and 1905, and the work has since become one of his most well-known pieces. Certainly, it is one of his greatest and most descriptive pieces. Debussy named it La mer, trois esquisses symphoniques pour orchestre (or "The sea, three symphonic sketches for orchestra"), but usually people just call it La Mer. He made it clear that even though the movements have descriptive titles, he didn't consider the work program music. As an impressionist, Debussy was conjuring up just that--musical impressions, in this case of the sea. Debussy said he wanted the first movement, "From dawn till noon on the sea," to be a little less showy than the other movements and added that the conductor should take it slowly and animate it little by little. It begins with a warmly atmospheric introduction and then opens up about halfway through to a rapturous melody. In this first movement, Krivine takes the composer at his word, and it is quite gentle until opening up to the big melodies. In this regard, it reminded me of Jean Martinon's rendering of the work, sweet and lyrical. The composer intended the second movement, "Play of the waves," to sound light and carefree, the dancing waters luminescent and magical. He indicated it should be an allegro (a brisk, lively tempo), animated with a versatile rhythm. In reality, the second movement acts as a kind of slowish scherzo, although, to be fair, it isn't actually slow or fast. As its subtitle indicates, it's more playful than anything else, and again Krivine does well by it. His approach is perhaps not so frothy or enchanting as Martinon's, Previn's, or Reiner's readings, but it is charming nonetheless. 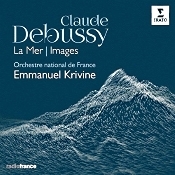 Accompanying La Mer is Debussy's Images pour orchestre, which he wrote between 1905-1912, originally designing it as a two-piano sequel to his Images for Solo Piano. As he did in La Mer, Debussy divided the work into three sections, three movements, each inspired by a country or a song. In the first section, "Gigues," Debussy used his recollections of England as his inspiration for the music. Krivine does a fine job conveying both the light and serious moods of the music, with an effective varying of contrasts, tempos, dynamics, and the like. In the second, longest, and probably most-familiar section, "Iberia," Debussy used his memories of Spain as inspiration. He further divided this section into three more parts: "Par les rues et par les chemins" ("Through the streets and the paths"); "Les parfums de la nuit" ("The fragrance of the night"); and "Le matin d'un jour de fête" ("The morning of a festival day"). Here, Krivine is in his element, with pleasantly flowing rhythms. Although his account of things is perhaps not as lively as Argenta's performance or as well recorded as Haitink's, it does capture much of the music's color and joy. In the closing section, "Rondes de printemps ("Round dances of spring"), Debussy relied for inspiration on a pair of songs. Krivine does a splendid job with this section, finishing up the piece by tying it to, if anything, La Mer, with its frolicsome play of tunes, phrases, and tonalities. I'm sure Krivine didn't emphasize these similarities by accident, and it provides an appropriate way to end the program. Finally, as a bonus track, we get an excerpt from Debussy's original 1905 version of the third movement of La Mer, which contains a brief fanfare in bars 237-144 that the composer later decided was inappropriate and cut. Producer Daniel Zalay and engineers Maiwenn Legehan and Philippe Thibaut recorded the music at the Auditorium Radio France in March 2017. The sound they obtained is clear and natural, with a fairly good orchestral perspective, depth and width, slightly warm yet fairly transparent. There is nothing spectacular about it; it's not as up-close as Stokowski's recording or quite as detailed as Previn's. It is realistic and engaging, with a decent frequency response (again, not heavy on the bass or treble) and a moderate dynamic range and impact. Music Director Daniel Hope and New Century Chamber Orchestra announces its 2018-2019 season including four subscription weeks in venues across the San Francisco Bay Area and a debut European tour of Germany and Poland. 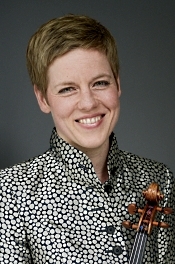 Recently announced as the ensemble's permanent Music Director, Hope will lead a season that includes a debut appearance by Venezuelan-American pianist Vanessa Perez performing Erwin Schulhoff's Double Concerto for Violin, Piano and Strings; the San Francisco premiere of Recomposed by Max Richter: Vivaldi – The Four Seasons featuring Hope as soloist; the U.S. premiere of Seavaigers by British composer Sally Beamish featuring Guest Concertmaster Anthony Marwood and Scottish accordionist James Crabb; and a program of American masterworks that showcases jazz legends The Marcus Roberts Trio. "I am thrilled to be leading New Century as Music Director and can't wait to build upon the many successes that we have enjoyed together so far," said Daniel Hope. "This orchestra has achieved many significant milestones in its 26 year history and thoroughly deserves its reputation as one of the finest chamber orchestras in the world." New Century's season opens November 1-4, 2018. For a complete list of places, times, and ticket prices, visit http://www.ncco.org. Concerts at Saint Thomas closes their 2017-18 season with "Four Hands, Four Feet: Daniel Hyde and Benjamin Sheen in Recital" on June 16, 2018 at 2 pm. In their debut duo recital, showcasing the magnificent pipe organs of Saint Thomas Church Fifth Avenue, NYC, award-winning organists Daniel Hyde and Benjamin Sheen perform virtuosic transcriptions of works from the orchestral and operatic literature. The pipe organ is one of the oldest instruments in the Western musical tradition. In the 19th century, before the advent of recording technology, transcriptions for organ of symphonic and opera works became a popular way for people to hear the masterworks of the repertoire – every area had a church with an organ. The Music Institute of Chicago, one of the nation's oldest, largest, and most distinguished community music schools, welcomed 300 guests to its 2018 Anniversary Gala on Monday, May 21 at the Fairmont Hotel Chicago. The event raised more than $715,000 from a combination of table sponsorships, ticket sales, and outright contributions. The evening included a cocktail reception, followed by an elegant dinner and awards presentation. Musical performances took place throughout the evening, representing every area of the Music Institute. Highlights included young musicians from the Community Music School; award-winning students from the renowned Academy, a training center for gifted pre-college musicians; and young students from its outreach programs, including ArtsLink, an arts integration program offered in partnership with Chicago Public Schools, and Third Coast Suzuki Strings, a violin program on Chicago's Northwest Side in collaboration with the YMCA of Metro Chicago. The prestigious Dushkin Award, established 30 years ago and named for the Music Institute's visionary founders, Dorothy and David Dushkin, recognizes international luminaries in the world of music for their contributions to the art form, as well as to the education of youth. This year's recipient, Pinchas Zukerman, has remained a phenomenon in the world of classical music for more than four decades. Join us for our 48th annual summer season, Music Without Borders, July 17-29, 2018, featuring 30 events in 19 different venues in beautiful San Luis Obispo County, California. Explore all of Festival Mozaic's unique concert series: Orchestra, Chamber Music, UnClassical, and Notable Encounters. The Festival also offers a range of Free Community Events, including lectures, open rehearsals, master classes, and the popular Midday Mini-Concerts. Yannick Nézet-Séguin, Music Director of The Philadelphia Orchestra, incoming Music Director of the Metropolitan Opera and Artistic Director, and Principal Conductor of the Orchestre Métropolitain de Montréal, has signed an exclusive contract with esteemed classical label, Deutsche Grammophon. 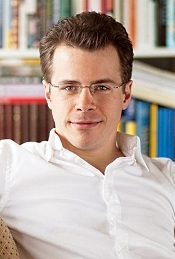 The Montreal-born conductor, hailed by the Financial Times as the "greatest generator of energy on the international podium," will record a broad range of symphonic and operatic repertoire under the label as part of his work as Music Director of The Philadelphia Orchestra, the Metropolitan Opera of New York, the Orchestre Métropolitain de Montréal, and as an Honorary Member of the Chamber Orchestra of Europe (COE). The contract was signed in Hamburg on May 30 2018, during Nézet-Seeguin's nine-city tour of Europe and Israel with The Philadelphia Orchestra. Miami Music Festival (MFF), an intensive training program for the next generation of classical musicians, announces the lineup for the 2018 season from June 5 through July 29, 2018 at various venues in Miami. In its fifth season, MMF will host young artists from around the world selected from top conservatories and universities. This year, 250 students from over 25 countries will receive instruction from an assembly of world-class faculty while the community benefits from accessible public concerts featuring many of the industry's most talented artists. This season will include musical milestones such as the return of MMF's POPS Concert and Independence Day Celebration after a successful first year, and the directorial debut of Antoine Wagner-great grandson of famed German composer Richard Wagner- as the MMF's critically acclaimed Wagner Institute stages complete Acts from Lohengrin and Die Walküre. Children's choirs are woven through the 150-year history of New England Conservatory. 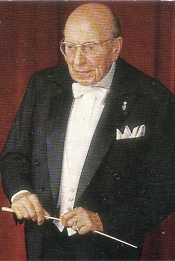 Two years after Eben Tourjée opened NEC, famous bandleader, Patrick Gilmore (he penned "When Johnny Comes Marching Home") conceived the idea of a "Great Peace Jubilee." He asked Tourjée to organize and train 20,000 chorus members and an orchestra of 2,000. Many children participated in the chorus from all over the United States. The coliseum built in 1872 for the Jubilee was situated on what is now the Copley Plaza Hotel. It covered four and a half acres, seated 50,000 people, and contained the world's largest organ. Continuing the tradition of children's choir, New England Conservatory presents an afternoon of delightful choral music with its Preparatory Chorus, Children's Chorus and Chamber Chorus. The afternoon will be conducted by Carey Shunskis, who also curated the program. Studies show there are many benefits for children who sing in groups, including positive social, community, and academic development. The NEC Children's Chorus event will be held on Sunday, June 10, 2018 at 3:00pm in NEC's Jordan Hall. The Young People's Chorus of New York City (YPC) partners with Yale Choral Artists for two concerts in New Haven and New York that explore the theme of citizenship--Saturday, June 16 at 2:00 p.m. at the Yale School of Music's Morse Recital Hall and Monday, June 18 at 8:00 p.m. at Merkin Concert Hall, respectively. The performances feature works that engage with such topics as immigration, inclusion, and national identity, including world premieres of Paola Prestini's The Glass Box (YPC and Yale Choral Artists co-commission; to be performed June 16 and 18) and Arturo O'Farrill's Borderless (YPC commission; to be performed June 18), as well as works by Dominick DiOrio, Michael Gordon, David Lang, and YPC Founder and Artistic Director Francisco J. Núñez, among others. The two choirs sing separately as well as together, and both Mr. Núñez and Yale Choral Artists Director Jeffrey Douma conduct. The performance in New Haven is programmed within the Yale International Choral Festival, which is part of the International Festival of Arts & Ideas.